If you have never actually sat through this film, I kind of have to recommend that you do, if only to see how a film can manage to fail to be good at any stage, on any level. What is so fascinating about this film is that nothing works, at all. Got Geoffery Rush, Clancy Brown, Ryan Reynolds and Taika Waititi in your film? Doesn't matter, because the costumes, script, cinematography and direction are all pulling in different directions and nothing comes together at any stage. And it's not that the bare bones of the story don't work as an outline; Hal Jordan gets the Green Lantern ring, travels to Oa where he is trained to be a member of the corps, returns to Earth and defeats the villain. That's pretty much all a Green Lantern film really needs to be. That's the real shame here; the utter failure of anyone attached to the project to deliver on the premise. I suppose I should talk about the CGI? Because that always seems to come up when talking about Green Lantern. 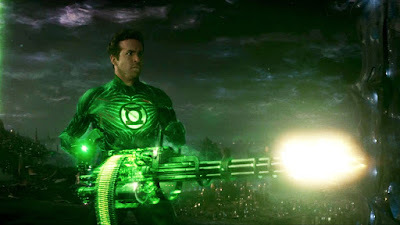 Yes, the costume looks stupid, it's Ryan Reynolds' head floating in a greenscreen, of course it looks stupid. Yes, it would have looked better with practical effects, but no one does practical effects anymore (except maybe Duncan Jones), because of the time and expense. Probably the best compromise would have been CGI powers and "real" costumes, but I can see the reason behind the decision, even if it turned out to be a bad one. Hell, with a decent script, even the CGI costume may have been forgivable. The real problem is the narrative and, especially, the villain; I know Hector Hammond has changed since the Silver Age, but I still think of him menacing GL with his "Future Brain". Hammond, Paralax, Sinestro, that's way too many villains for the first film in the series, the audience has no idea who these people are or why they should care. So Paralax is concentrated fear? Does Hal defeat it by being brave? 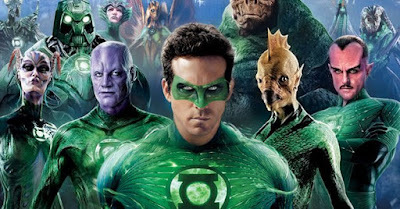 Not really, just whip at it with some CGI boxing gloves and everything will be ok. Uninspired is the word that I associate with Green Lantern, it feels like no one wanted to work on the film and just happened to be under contract. This feels especially disappointing to watch after Iron Man having been out just a few years previous, like an anachronistic '90s superhero film that found its way into the wrong decade. I'm glad this never went anywhere, because Green Lantern actually deserves better than this.